In medium nonmetal bowl, combine lime juice, salt, oregano, cumin and garlic; mix well. Add chicken tenders; stir to coat. Let stand 15 minutes. Meanwhile, heat oil in 12-inch skillet over medium-high heat until hot. Add onions and bell peppers; cook and stir until crisp-tender. Move vegetables to side of skillet. Remove chicken from marinade; add to skillet. Discard marinade. If necessary, add additional oil to skillet. Cook and stir about 8 minutes or until chicken is no longer pink in center. Meanwhile, heat oven to 350°F. Wrap tortillas in foil. Heat at 350°F. for 10 to 12 minutes or until warm. 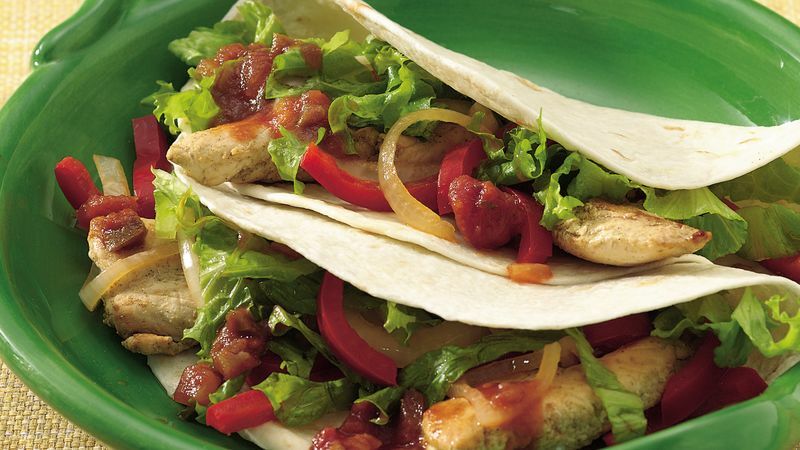 To serve, fill warm tortillas with chicken, onions, bell peppers, lettuce, tomatoes and salsa; fold over.